There’s an art to finding the ideal duvet. From getting the right tog rating, to choosing the perfect filling for different seasons - your duvet can really enhance a night’s sleep. 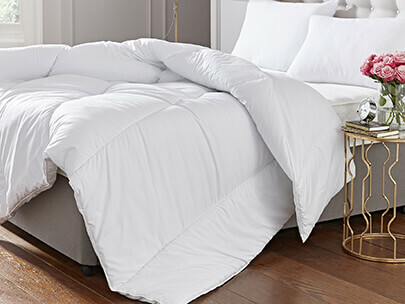 This guide will give you everything you need to know about buying a duvet that helps you sleep soundly and suits your personal sleeping habits. What are duvet tog ratings? Tog ratings act as easy-to-digest reference points for people to understand how warm a duvet will keep them. In short, the higher the tog rating, the warmer the duvet will keep you. Tog ratings work on a scale from 1 to 15, and it’s generally advised that tog ratings over 10.5 are ideal for the winter to keep you warm and sung, while duvets with tog ratings up to 7 are best used in the summer to help prevent overheating. Tog ratings between 7 and 10.5 will see you comfortably through later Spring and Early Autumn. At Silentnight, we offer 4.5, 10.5 and 13.5 tog ratings. 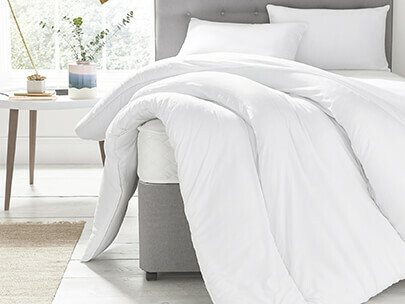 We also offer an all seasons duvet that comes with a 4.5 tog duvet for the warmer months and a 9 tog for neutral months, with both combining via velcro fastening to create a 13.5 tog for cooler months. This way you don’t have to store 3 separate duvets all year-round. OK, so now we understand what tog rating means, let’s move onto duvet fillings. The duvet filling you choose largely depends on your sleeping habits. We offer two types of synthetic duvet filling; hollowfibre and microfibre. Our hollowfibre fillings feature naturally hypoallergenic components and are made from spun polyester. Microfibre fillings are thinner and lighter than hollowfibre. You’ll often find microfibre fillings in premium duvets that offer a luxurious feel. Are your duvets machine washable? Yes, all of our duvets are machines washable on a 40℃ temperature setting. It’s recommended that you wash your duvet every 4 months to remove irritants and bacteria.